Ready to update your closet for the changing season? 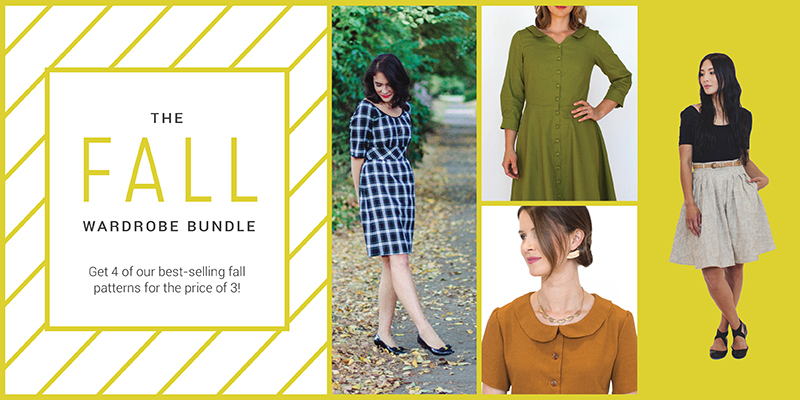 We’ve got you covered with the Fall Wardrobe Bundle! All it takes is a few patterns and some well-chosen fabric and you will be ready for all that the season has to offer. Hawthorn offers three mix-and-match variations perfect for fall layering. Stitch this shirtdress in a gorgeous plaid for an autumnal touch. Add a classic tailored look to Dahlia by using a light weight wool. The Zinnia skirt is cute with tights and boots. Try a fun print for a twist on classic fall style. Sew Violet in a silk for a fashionable layering piece that looks cute with a cardigan or on its own. Grab all four for 25% today and get stitching! You can find the bundle in the shop here.